If you live outside of the United States, we recommend that you purchase the following products from Amazon.com to avoid higher shipping costs. For Special Combination Offers, click here. We use PayPal for our payment processing—the most secure and easy payment processor on-line today. IMPORTANT: After checking out with PayPal, click on the “Return to [email protected]ing.com” link that will appear just below your transaction ID on your PayPal web page. This will allow you to complete your transaction, download your products or view special information about your order. Are you a Reluctant Metaphysician? A career change, an upsetting external event, a serious illness, a painful breakup, or an unraveling culture can all be invitations to enter a deeper world behind the world. You many not have chosen to go there, but you evolve thereby. 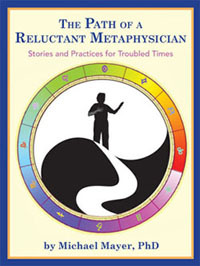 This book weaves together stories and reflections to introduce teachings and practices from ancient wisdom that illuminate our unique life path, including the metaphysics of myths, ancient traditions, bodymind healing and psychotherapy, astrology, and politics. If you would like to buy the book through Amazon's CreateSpace E-store, please submit your name and e-mail address, which appears in the sign-up box in the upper right corner of every page (also receive a free article by Dr. Mayer on Standing Meditation), for a direct link to Amazon. TO ACCESS YOUR PDF AFTER PURCHASE: After checking out with PayPal, click on the “Return to [email protected]” link that will appear just below your transaction ID on your PayPal web page. This will take you to a page with a link that will allow you to access your new pdf. Psychology meets astrology in this exploration of that ancient question, “Who am I and what does my life mean?” The author leads readers on a journey beginning with his own forty-night vision quest in the woods alone, to Native American and other ancient and modern traditions of identity formation. The first edition of this book was written between 1973 and 1977 as a doctoral dissertation called, "A Holistic Perspective on Meaning and Identity: Astrology as a Language of Personality in Psychotherapy." It won the astrology prize from the Astrological Association of Great Britain for being the most valuable contribution to astrology in 1979. The book was then turned into this popular book, called The Mystery of Personal Identity, now in this updated 2nd edition. In this new second addition, the author gives the reader more information on his personal background, and how as a sceptic he reluctantly came to be moved by the power of astrological symbols. He shows why over three decades he has continued to believe “the meaning reorganization orientation point of view” for astrology can make astrology palatable even to sceptics. Dr. Mayer then applies that viewpoint to the current circumstances of our political world. Read more. To read a Review of The Mystery of Personal Identity from the Astrological Association of Great Britain, Click Here: Mystery of Personal Identity - AA Journal review. To listen to Dr. Mayer's lecture at the California Institute about The Mystery of Personal Identity, click here. Energy Psychology presents a comprehensive approach to healing that combines leading-edge Western bodymind psychological methods with a broad range of sacred traditions. 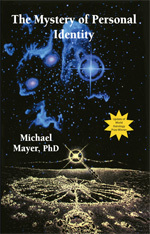 The book blends Chinese medicine approaches, including Qigong and acupressure; kabbalistic processes; methods drawn from ancient meditation practices; and psycho-mythological storytelling techniques. Drawing on thirty years of training in Tai Chi and Qigong, Dr. Michael Mayer shows how integrating the essences of these practices can restore vitality and provide self-healing tools for physical and mental health. 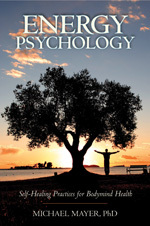 Unlike quick-fix books on energy restoration, Energy Psychology uses time-tested age-old practices in combination with well-established clinical approaches. Highlighting valuable real-life case studies, the book presents bodymind healing methods to treat anxiety, chronic pain, addiction, hypertension, insomnia, trauma, and other prevalent conditions. You’ve heard psychotherapists called “shrinks.” Bodymind Healing Psychotherapy takes the “shrink-rap” off to unveil an expansive view of psychotherapy and mind-body healthcare that includes ancient sacred wisdom traditions and energetic approaches to healing. This “era of energy,” begun by Einstein, is marked by an outer energy crisis and a search for sustainable solutions. At the same time, an equally insidious “inner energy crisis” is taking place where stressed-out, battle-fatigued soldiers of the information age reach for pills or extra cups of coffee on a quest to restore depleted internal reserves. In this book you’ll discover natural ways to harness the energy of life for bodymind healing, and how to sustain energy, replenish vitality, and cultivate inner peace. Secrets to Living Younger Longer is based on Qigong, a many thousand-year-old method of cultivating the energy of life (qi) through movement, breath, toucb, sound, and awareness. Scientific research documents how Qigong can lower blood pressure, increase balance and help with a wide variety of chronic diseases. But this is more than a book on Qigong exercises. Building upon those in the forefront of the mind-body healthcare revolution, Dr. Mayer has created a unique blend, combining Chinese Qigong and Western psychological methods with cross-cultural anthropological research. Secrets… is enlivened by mythic tales and imaginative teaching stories from ancient sacred wisdom traditions. 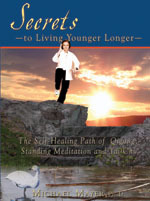 The book contains health and longevity practices, historical background, and in-depth research on standing meditation techniques. Just as Joseph Campbell, Robert Bly and Clarissa Pinkola Estes used myths to aid the evolution of consciousness in the individual, so does Trials of the Heart: Healing the Wounds of Intimacy, by psychotherapist and couples counselor, Dr. Michael Mayer, explores how ancient myths, fairy tales and stories can help us in our quest for a better understanding of human relationships. It sheds a ray of light into the dark and twisting labyrinth that intimate relationships so often become. 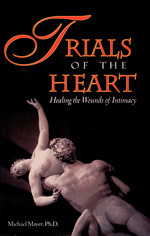 Trials of the Heart is an ideal guide for providing an entry way into practices and attitudes that will alter the way we handle the difficult moments and obstacles we face on the path of love. 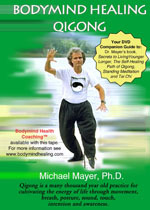 With the Bodymind Healing Qigong DVD become initiated into practicing some of the core methods of Qigong that were imparted to Dr. Michael Mayer over a period of twenty-five years from some of the most respected masters of these traditions. After twenty years of teaching Qigong and Taiji Chuan, he has synthesized this knowledge into a single form. Originally produced as an audiotape for cancer and chronic diseases, many of Dr. Mayer's patients now use the River of Life CD to help facilitate the healing process for insomnia, hypertension, and general stress reduction. 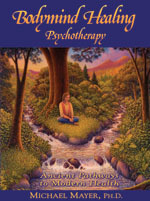 As discussed in the book Bodymind Healing Psychotherapy (BMHP), the CD is an enhancement to this core method of BMHP. It is used in hospitals, and by mental health professionals and body workers to complement treatment. The River of Life process provides: A.) A metaphor for the soul’s journey, B.) A felt experience of the Qi down the central meridian, C.) A method to activate blocks in the body and psyche, D.) A tool to dissolve those blocks. An article by Dr. Michael Mayer titled Tai Chi Chuan: A Postmodern, Metaphysical Point of View. BODYMIND HEALING PUBLICATIONS: publishes in-depth books with leading-edge healing methods. Each book is an inspiring read and a journey into transformational, life-enhancing practices that integrate body, mind, and spirit. Contact Dr. Michael Mayer, Email: [email protected], 2029 Durant Ave., Berkeley, CA 94704, 510-849-2878.